The sport of synchronized skating is a large and fast-growing discipline of figure skating where 8-20 (the number of skaters on a team depends on the level) skaters skate on ice as a team, moving as one flowing unit at high speeds. The discipline was originally called precision skating in North America because of the emphasis on maintaining precise formation and timing of the group. For a synchronized team to flow in unison, individual skaters must be competent at a variety of skating skills, including speed, footwork and ice presence. The team performs a program set to music, with required formations including circles, lines, blocks, wheels and intersections. The teams are required to perform step sequences involving a number of various turns such as twizzles, counters and rockers and simpler turns like three-turns, mohawks and choctaws. 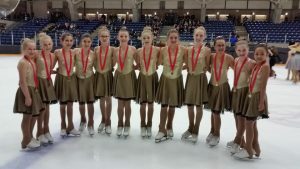 At our Delta Skating Club we have a great coach in Melissa Tye and Jackie Hadden who take our skaters under their wing and to many competitions thru the season. Our teams “Solar Ice” – Juvenile Team and “Solar Flare” – Beginner Team competed in many competitions in 2014-2015. 2. Each skater much have team spirit and work hard and support and respect team members. 3. Skaters are required to skate 2-3 days of the week. 4. Fundraising is mandatory to pay for competitions, coaching, costume and practice outfit costs.